Lock in a great price for Hôtel Alpes & Lac – rated 8.6 by recent guests! Great location and good value (especially for Switzerland). Good location, very clean & confortable, good breakfast. Classic older establishment across from train station. We had a room with lake view. It was quiet, spacious, bed was very comfortable and it had a balcony with view of the lake and Alps. Staff was very friendly and helpful. Included was a mobility card for the area with several passes for museums and various local attractions. Excellent value. The front office staff were very friendly and helpful. This hotel is in an older building directly across from the train station with a very nice view of the lake and the mountains IF you book a lakeside room. They have a very nice terrace bar in the back and if you happen to be passing through or need to wait some hours for a train this is a great place to relax and get a drink. With the funicular just next door it is easy to walk the town but get back up to the top once you are tired. Easy walk from here to the Botanical Gardens, which was very pleasant. the hotel view, the room, the breakfast on the Terrasse, the staff...everything was perfect :) thanks! The room had a view to the lake which was outstanding. We had a corner room with an additional view to the city. It was very comfortable. Great location next to train station and public transportation. Big room in nice, old building. Excellent breakfast. The room was quiet and comfortable and the view of Lake Neuchâtel and the Alpes was very nice. - Our reservation was freely upgraded to lake view (instead of street view). - The bed was excellent, very comfortable. - Very calm room and hotel. - The staff was excellent, nice and helpful. Hôtel Alpes & Lac This rating is a reflection of how the property compares to the industry standard when it comes to price, facilities and services available. It's based on a self-evaluation by the property. Use this rating to help choose your stay! The city of Bern is only a 36-minute train ride away; Lausanne can be reached within 48 minutes. 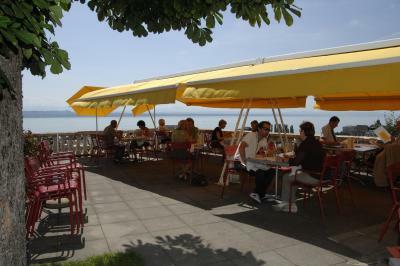 Lake Neuchatel is within easy walking distance. 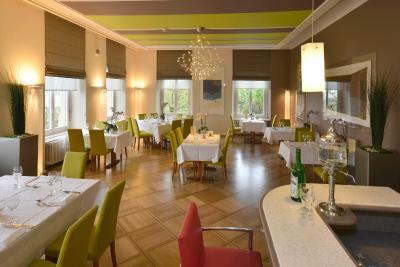 Hotel Alpes & Lac features a restaurant with a rich buffet breakfast including local products. 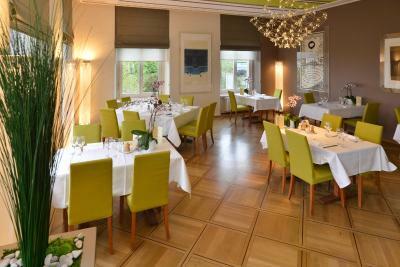 You can also enjoy your meal on the terrace with panoramic views. All guests at the hotel receive a permit allowing free parking for an unlimited duration in the public parking spaces in the white zone around the hotel. When would you like to stay at Hôtel Alpes & Lac? Comfortable rooms with free Wi-Fi and lake views. Comfortable rooms with free Wi-Fi and views of the street. House Rules Hôtel Alpes & Lac takes special requests – add in the next step! Hôtel Alpes &amp; Lac accepts these cards and reserves the right to temporarily hold an amount prior to arrival. Hôtel Alpes & Lac accepts these cards and reserves the right to temporarily hold an amount prior to arrival. The "Schweizer Postcard" is accepted as means of payment. Room was a little dated. Not much of a "breakfast buffet". great view and near the train station. - The room was a little bit too warm, without possiblility to turn down the heating. The room was a bit small for the price, that did not include breakfast. I loved the view and the room was very quiet and clean. The staff was very friendly. It was quite noisy as I could hear my neighbors talking and watching TV. But otherwise I can’t really complain. It was clean, comfortable, and the staff were friendly. It was the perfect room for a short trip. We booked a street view room, but we we upgrade to a lake view room, where we could admire also the Alpes (and even swa a bit of Montblanc one day). The view was great. The staff very pleasant. Not applicable as I was satisfied by all aspects of the hotel. Location was ideal and staff were outstanding. The street is a bit noisy in the morning. The key system is of an older type, no card entry. There is no ramp beside the entrance straircase if you have a heavy suitcase. The service was very friendly. The room was clean and with a nice corner view. The location is very convenient close to the train station. Very nice hotel in a lovely smaller Swiss lake city which is off the usual Anglo tourist circuit. The hotel has an outdoor bar and restaurant area that is very noisy until late at night and is situated directly below the more expensive lake view rooms with balconies. The rooms are not soundproof and if I HAD KNOWN ABOUT THE OUTDOOR BAR AND RESTAURANT AREA , I WOULD NOT HAVE STAYED AT THIS HOTEL - VERY DISAPPOINTING EXPERIENCE ! Great view of the city. We booked one room with lake view. The hotel is on the hill so that the view is especially good. The staff is very kind. I forgot one bottle of wine overgrand when I was checking in，the girl kept it well for me.